Grow Lights: What are they and how are they used for growing cannabis? Indoor marijuana grow lights growing marijuana are used when setting up your cannabis grow room. Depending on what stage of growth your plants are in will determine what color light (spectrum) should be used. The Grow Lights Color rating is Measured in Kelvin (K). The higher the number, the more bluish the light. 4000K-7000K is mostly on the blue side of the spectrum, while 3000K and under goes from a white spectrum, to a redder spectrum. During Vegetative Growth your plants need a minimum of 18 hours a day of Light. The best Grow Lights for Vegetative Growth are 400 Watt Metal Halide Agrosun Blue Grow Lights. Metal halide grow lights are optimal for use in the vegetative phase of growing. They emit mostly blue light, which encourages vigorous growth of foliage. They are very efficient, but can get rather expensive to start with; Hydrofarm FLT24 2-Feet Four Tube T5 Fluorescent Light System may seem more appealing because of their lower price, and they are not much different when compared on a lumen-to-lumen cost level. These lights can be used through-out the grow, but will most likely result in light, fluffy buds. 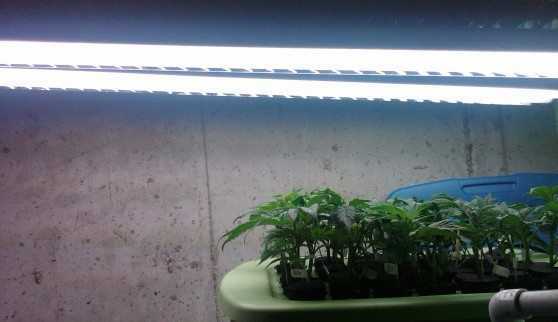 I recommend using fluorescents for seedlings and clones, while using Metal Halides for moms and vegetative growth. I prefer to use Hortilux Eye Blue Metal Halides as they have always worked perfect for me. as my Grow Lights for Blooming. Please check our Lighting Section for detailed information and specs on all Cannabis Grow Lights. The Flowering Light Cycle is the cycle you set your High Pressure Sodium Lights on to bud your marijuana plants. Metal Halide (MH) Grow Lights.